Ever seen a closet as big as a small studio apartment? You're about to. Personally, having an amazing closet has always been a dream of mine. Luckily, you don't need a gigantic space to have a great close it. 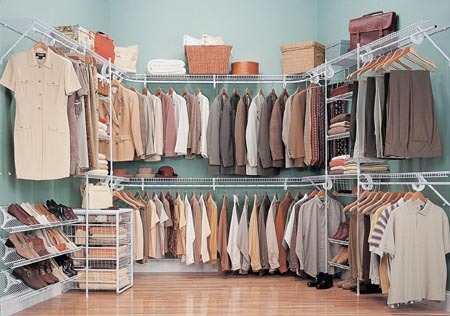 The closets below are amazing, sure, but you can also use them for inspiration to make your own awesome closet space. Nothing is too special about this closet, except that it’s excessively large. Not only will this closet make one want to buy more shoes, but more clothes as well. If one isn’t worried about the lack of natural sunlight, they could always turn this closet into a room. The carpet, however, doesn’t really go with a bedroom that well. This is more of a storage room if anything. What’s really unique about this closet is its elegant wooden floor. Although not shown in the picture, it looks as if there’s a sun roof letting natural light in. Because of this, it would most likely make a great extra bedroom. The blue walls add even more of a bright, uplifting atmosphere. Aside from that, this closet is rather large, but nothing too crazy. This walk-in closet combines the design of a regular closet with the sheer size of a walk-in closet, which makes this one so unique. Instead of having a door, like a typical walk-in closet, it has a long sliding door that is commonly found in regular closets. One could also call this one the hallway closet. One could very easily make an office out of this particular closet. The one thing about this walk-in closet that sets it apart from others is that it doesn’t have a door whatsoever. A car could literally be driven into this closet. The closet is basically another part of the house. Because of this brilliant design, it lets in a lot of natural sunlight, giving it the uttermost uplifting atmosphere. Much like the oversized conventional closet mentioned above, this one has a huge sliding glass mirror door. When opened, it essentially looks like part of the room, especially with the same colored carpet. Grey, black and white are the most prevalent colors in this elegant design. Around 15 people could easily fit into this walk-in closet. This closet is the size of a large bedroom. The walls on one half of the room are surround by wooden shelves, giving one plenty of space for clothes, shoes or whatever. 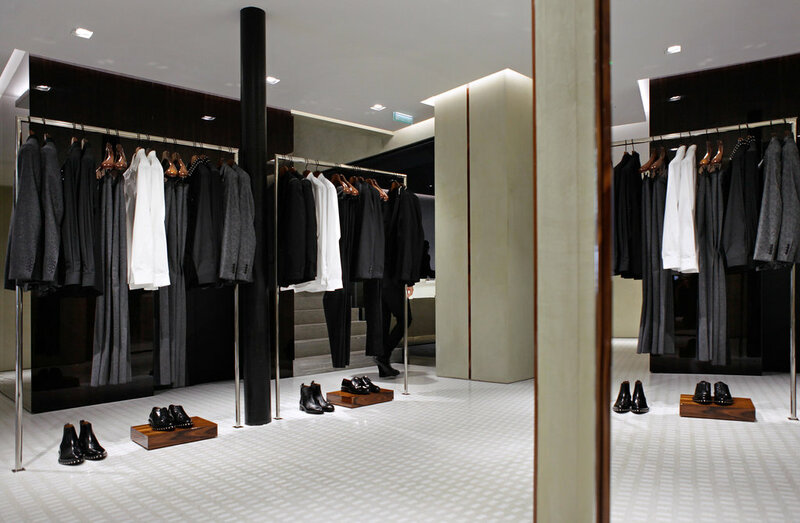 The white, tile-like floor appears to be what one would find in a mall or clothing store. In the center of the room is a rug attempting to cover the mundane white floor. 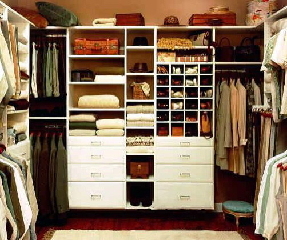 This particular closet gives a walk-in closet a whole new definition, due to its enormous size. 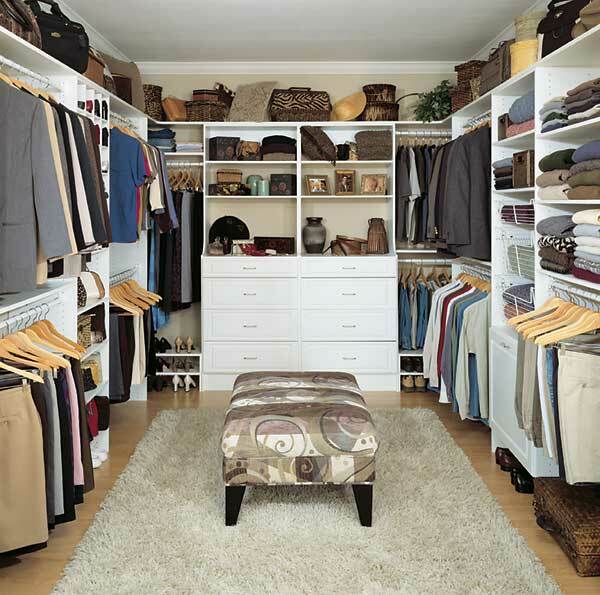 One could place a king sized bedroom into this closet and still have plenty of room. Not only does this closet have wooden floors, but it has a wooden floor ceiling as well. The center black and white rug compliments the closet even more. This closet really takes the cake. This closet has a nice home-style appearance and atmosphere, thanks to the white cabinets/shelves and wooden floor. It appears to be strictly designed for clothing storage only. Regardless, the closet has plenty of storage space. The center carpet rug gives a comforting feel for those who enter its domain. 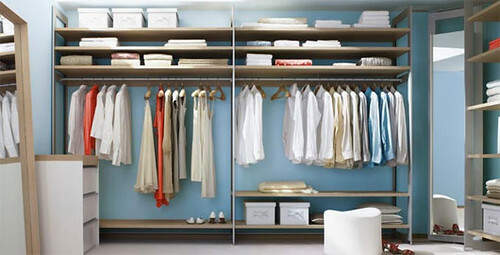 Two sliding doors enclose a vast area of closet space. Unlike other similar designs mentioned in this list, this sliding door closet area is an overall square shape, giving one the ability to do whatever they please. White seems to be the most dominant color, along with hints of tan. The most prominent feature is the sunroof that lights up the closet like daylight. Carpet is in place for added comfort. This closet has no actual doorway, but a wide opening that leads to the main closet room. In the center of the wooden floor is a stationary, white dresser. On the ceiling are tiny lights that work together to light up the room. 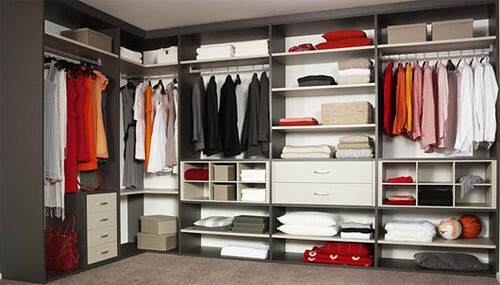 Built in shelves allow one to store all their clothing accessories. The entire room is overwhelmed by a bright white. 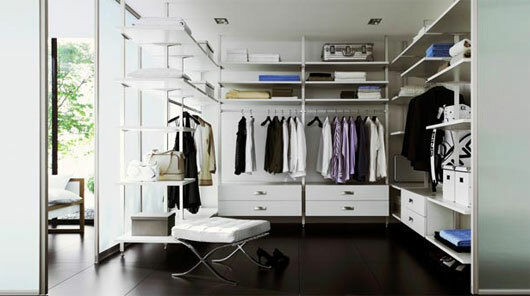 Instead of a bright white, this closet design sets grey as the number one priority, giving it a quite dull appearance. Even the carpet and ceiling are a light grey. Despite the dull look, one should have plenty of place to store their belongings. On the bright side, bright colored clothes can really sparkle up this closet. Underneath that white rug is a beautiful redwood floor. It’s really a wonder why one would ever want to hide it. The light brown colored walls seem to compliment the redwood floor very well. The size of the closet is about twice that of the average bathroom. The tall ceiling allows one to store items on the very top of the shelves. Instead of having to store shoes on the floor, there are little square boxes designed for shoe storage. When one takes a glance at this walk-in closet, they will become quite perplexed at what they’re looking at, thanks to the over usage of mirrors. There isn’t much area where one can store clothing, except for the isolated hanger post. The shelves inside this closet resemble kitchen cabinets very closely, especially with the kitty corner. The drawers themselves open up just like a kitchen cabinet would. The ceiling, carpet and “cabinet” shelves are all a light wooden color. Plus, one has plenty of space to walk around. In the kitty corner is a mirror with one cabinet on top and one on the bottom. Overall, the design of this closet looks very inviting and exotic. Instead of the door being located in the center of the wall, it’s location is at a kitty corner angle. Upon walking in, one cannot help but notice the bright baby blue walls. On the opposite side of the door is an isolated mirror. This would be the perfect theme for those who live in beach areas, or like beach themes anyway. The most notable feature of this closet is the red ceiling and long, hallway-like design. This is definitely not for those who are claustrophobic. In the middle of the ceiling is a lamp that illuminates the entire room filled with white walls. Although it looks like a room, this one is actually a walk-in closet that happens to have a window, giving it plenty of sunshine. There’s plenty of room to store clothing items as well. The purple walls on the right and white walls elsewhere really add a great level of contrast.